My Netflix Instant Top-Ten Classic Films, 1st Ed. is one of the most popular posts on The Blonde at the Film, so here are five more from Netflix’s ever changing lineup! Check out the 3rd Edition, 4th Edition, 5th Edition, 6th Edition, and most recent 7th Edition of my Netflix Instant Classic Films list for even more classic movies available to stream! For more on classic films, follow me on Twitter, tumblr, Instagram at BlondeAtTheFilm, pinterest, and Facebook. If, like me, you’re stuck in an everlasting winter, try faking a heat spell with this sultry film starring real-life couple Paul Newman and Joanne Woodward. It’s a Southern Gothic tale based on several of William Faulkner’s works, namely The Hamlet and “Barn Burning.” The film also took inspiration from Tennessee Williams’ play “Cat on a Hot Tin Roof,” which came to the silver screen that same year, and also starred Paul Newman, this time opposite Elizabeth Taylor (Summer was filmed first). Besides Woodward and Newman, who were married shortly after finishing this film, the movie stars Lee Remick, Angela Lansbury, and a bloated Orson Welles, who made things difficult for just about everyone during production. This film is heavy on Southern atmosphere and Southern accents, with plenty of heat, languid fans, and sprawling porches. If that’s not enough for you, it’s worth it to see Newman and Woodward in their first film together. Here’s the trailer. 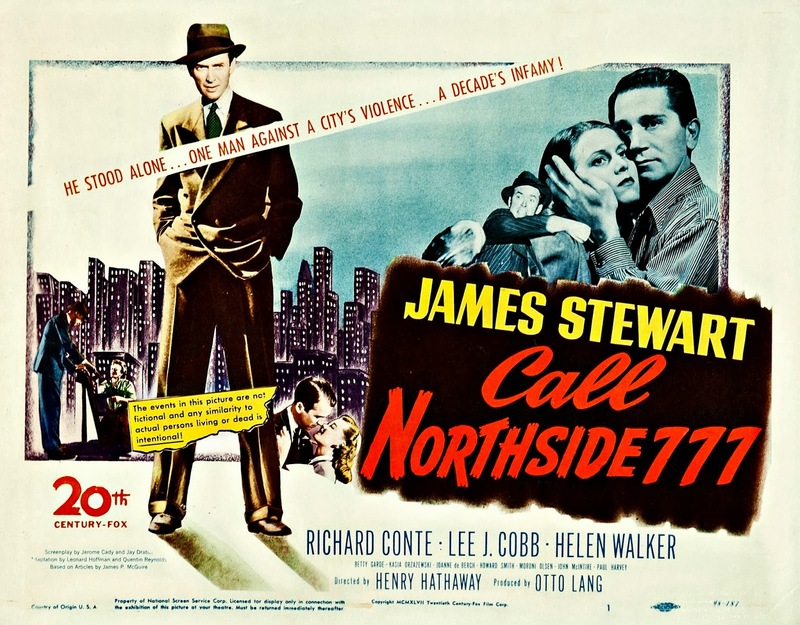 This little known film noir stars James Stewart as a determined reporter trying to prove a convicted killer innocent. It’s shot in a documentary style, and it’s based on a true story of two wrongly convicted men who were eventually freed thanks to a newspaper reporter. This film is gripping and a little less goofy than some other film noirs (some argue that it isn’t a true noir-you decide). It is set in Chicago, and it was actually filmed there, which makes it the first Hollywood feature to be shot entirely in Chicago! Here’s the trailer. This is Billy Wilder’s famously funny film in which Jack Lemmon and Tony Curtis disguise themselves as ladies in order to escape from the Chicago mob. They witness the St. Valentine’s Day massacre and gotta get out of town–their only option is to squeeze into girdles and high heels as members of an all-girl band heading to Florida. The band includes Marilyn Monroe, a singer on the hunt for a millionaire. Wonderful antics ensue, including Curtis’ fantastic parodic imitation of Cary Grant, Lemmon’s confused, adorable boyfriend, Monroe crooning “I Wanna Be Loved By You” in a barely-there dress, and the mobsters’ coincidental arrival in the very same hotel! Monroe wasn’t doing great during production–she needed 47 takes to say the line “It’s me, Sugar,” for instance, but Wilder made it all work. It’s a really marvelous, hilarious film. Here’s the trailer. This film features Marilyn Monroe in one of her first important roles, but the movie belongs to Bette Davis and Anne Baxter. Celeste Holm, George Sanders, and Thelma Ritter are excellent, too. It’s the story of an established theatre star (Bette Davis), and her struggles to stay on top as up-and-comers challenge her dominance. One ingenue in particular, Eve (Anne Baxter) proves to be a potent threat both personally and professionally…the film was nominated for fourteen Oscars (only Titanic received as many), and it won six. It also holds the record for most female acting nominations (four: for Davis, Baxter, Holm, and Ritter). Fun fact: Bette Davis would fall in love with and marry her co-star from this film, Gary Merrill. Another fun fact: Mary Orr, who wrote the short story that the film was based on, said she named the Baxter character Eve Harrington after Stanwyck’s characters in The Lady Eve. 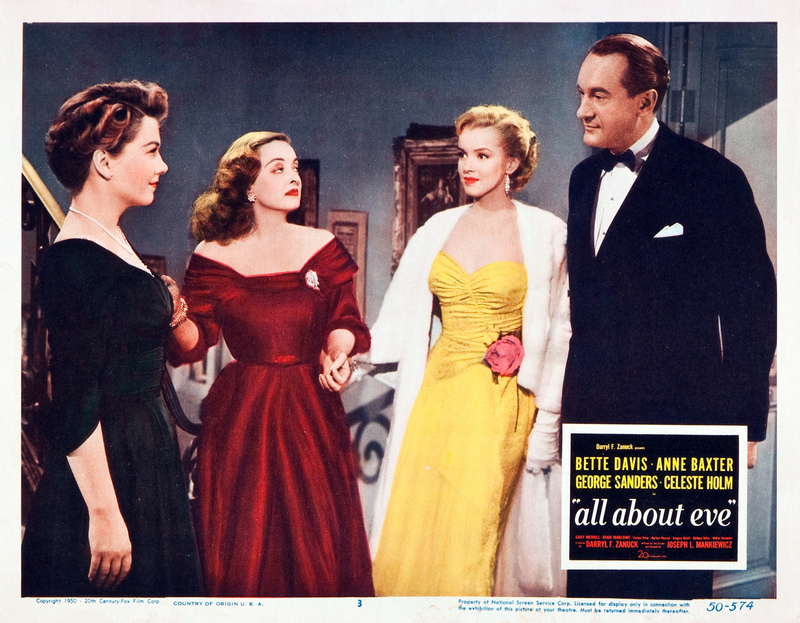 Yet another fun fact: The dress Davis is wearing in this lobby card was not supposed to be off-the-shoulder; designer Edith Head designed it to have a square neckline, but just before filming realized that it didn’t fit! So Davis pulled the sleeves off of her shoulders–voila! Here’s the trailer. This is the only kind of ghost story I like. Gene Tierney, who is terrific, plays Lucy Muir, a young widow who moves to a seaside cottage with her daughter (Natalie Wood) in 1900. Lucy decides to stay in the house even after she finds out that it is haunted by the ghost of a handsome sea captain (Rex Harrison). Lucy and the ghost, Captain Gregg, become quite fond of each other, and he even helps her out of some financial difficulties. Captain Gregg encourages her to meet “live” men, though, which introduces a handsome suitor, George Sanders into the picture…he’s no Captain Gregg! The ghost and Mrs. Muir are in love, but that can’t work, right? Sigh. Here’s the trailer. For more, check out my other Netflix Instant Classics lists! And follow me on Twitter, tumblr, Instagram at BlondeAtTheFilm, pinterest, and Facebook! Nice picks Cameron, The Ghost And Mrs. Muir is one of my all time favorites. Tierney and Harrison have great chemistry in that film. I am a huge Anne Baxter fan and could watch her in almost anything. Some other Baxter movies you might want to try are : The Pied Piper(Monty Woolley version), Sunday Dinner For A Soldier, Angel On My Shoulder and I Confess. Thelma Ritter is a fun actress as well. She appears in the movie A Hole In The Head with EG Robinson and Frank Sinatra, a real funny film with some sentimental moments. Thanks, John! Thanks for reading and for your great recommendations! Wonderful choices! I concur with the inspired choice of The Ghost and Mrs. Muir. A little-known gem. 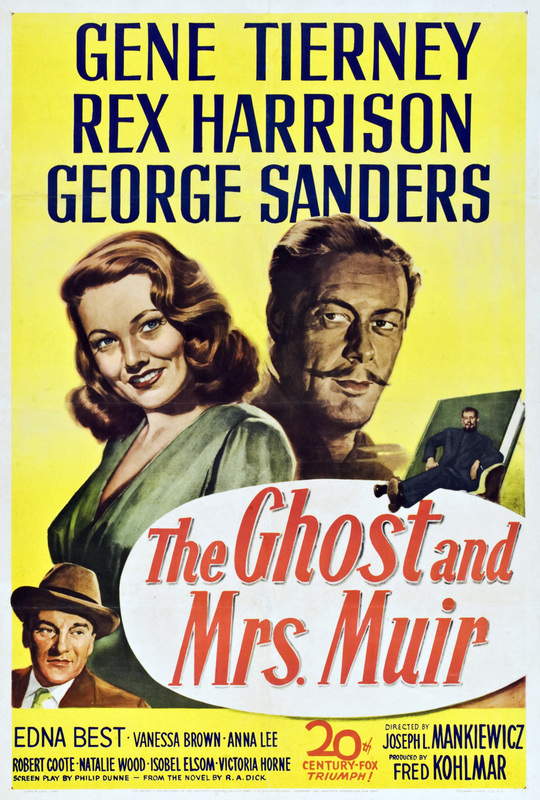 I love The Ghost and Mrs. Muir! I wish they still had The Mating Season on Netflix instant. I just remembered Thelma Ritter is in this movie, love her too!